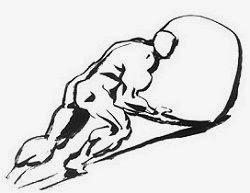 Our old friend, Sisyphus keeps rolling along. It was a weird weekend for boat money - good and bad, I guess. Friday in North Carolina one of my molars decided to fall apart. Monday morning, I had to enter a new dentist unannounced and ask for help. My old dentist is not 'in network' under the dental insurance at the new job. But the people at Hudsonville Family Dentistry were great. Three hours in the chair and I am all fixed up, just waiting for a new crown to be made and installed. I walked right in to an opening created by a cancellation. Some of you have heard me say "I'd rather be lucky than good." Also, this weekend I converted my blogs back to Blogger. As a humble traveller I don't need to be paying for cyberspace. My blogs are NOT super stars of the interwebs and the traffic really never justified having my own URLs. My writing and rambling site is back too. My zennish reflections blog has always been here on Blogger. And I sent in paperwork for getting s/v Bella documented by the U.S. Coast Guard. This will make it easier to check into foreign countries. Foreign countries are familiar with the USCG paperwork. Having only a state registration really slows down the immigration process. At least this last item was boat money spent on the boat. Glad you are amply compensated. There's nothing like a good dental plan to cover for your aches, right? It's always a good save, and always worthy of investment. It is practically a utility, so make the most out of it. All the best!